Dorm Co. Tip: Too bright? Too dim? Get the lighting level you want with a dorm lamp. Even if it's not as common an item for your dorm shopping list, dorm room lamps are still essentials for college dorms. While their function is quite obvious, their usefulness throughout dorm life only grows! Firstly, there will be plenty of nights spent reading at your dorm desk, just you and the textbook ... and your college dorm desk lamp! Whether you place this lamp for college on your dorm desk or atop a nearby dorm shelf, it'll make the task of late-night reading that much more bearable. Even when you're just browsing your computer or having a late-night snack, shed some light on the situation with a cheap lamp for college students. 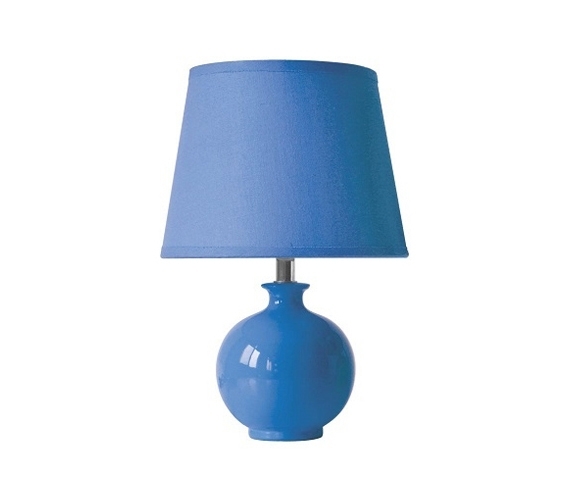 The Shining Glow Lamp - Sky Blue also adds a cool blue touch to your college decor. Why settle for everyday colors when all your dorm supplies can be colorful? A college light that adds to your dorm room decor truly has a bonus feature. And for all those other college decorations, some extra lighting will only bring more attention to them. Since dorm rooms are small, it takes only a couple basic lamps for college to provide sufficient lighting. But without any, you'll be left scrounging in the dark or relying on overhead florescent lighting, which just isn't ideal.